Exciting news! The album and UK tour is coming! So basicaly its not a full tour, and just doign small venues. Exactly, even if he did one every night through Feb in smaller venues its not going to satisfy demand. I meant its hardly 21 nights in the O2 is it selling nearly 500k tickets. Damn you Militant, my thread got locked even those it was first. i should have posted a big picture! It will be a shame if he only plays a few small venues as the tickets will most likely be pretty expensive and sell out quickly. Then again, if these are 3rdEyeGirl shows and not featuring the NPG, then they're really only suited to the die-hards. The general public would be dissappointed in not hearing Purple Rain in all it's glory. The majority of people would want a hits show. A 3rdEyGirl arena tour would be a bad idea, IMO. hmmm... very short notice gigs? Dammit!!!!! Lets see what occurs over the next few days. he so needs to play the Royal Albert Hall...it was made for him! I don't think these shows will b arena size i.e 6000-15000 capacity. Yeah, I know.. I said it was a shame, due to the unlikelyhood of actually getting tickets and how expensive they'll be, but it makes sense because 3rdEyeGirl shouldn't really play arenas, there would be too many disappointed people. This news has made my Friday, and my schedule for February is pretty empty. If these are small venues I would expect ticket prices to be quite steep, but I don't care. I'm very pleased it's 3rdEyeGirl too, if the videos from the European dates are anything to go by, we're in for a treat! Great news. Small venues, 3rdeyegirl, no Shelby and princes fro! Totally agree, Ever since I saw the Foals play there last year I have been hoping that he would play there. It is free between the 2nd and 6th Of February...and at least it holds a few thousand. Albert Hall would be the dogs !!! 'Iconic venues in London' ? ..... Jazz Cafe, Roundhouse, Hammersmith Appollo, Koko, Wag ? ??!?!?!? And you can't get much more 'Iconic' than the Royal Albert Hall, but it does hold around 4-5k, maybe too big as a hit and run? But would love to see him there. Also Brixton and Hammersmith both hold approx 5k, with a few days, weeks notice, could he fill these? Camden Roundhouse & the Indigo might be more in his mind. But accoustics are terrible at the RAH, I'm hoping for somewhere smaller. Roundhouse for me would be a good choice, and the Hammersmith shows were good. Bush Hall?! Or maybe he'll do venues that aren't commonly used as music venues. The Globe anyone?! 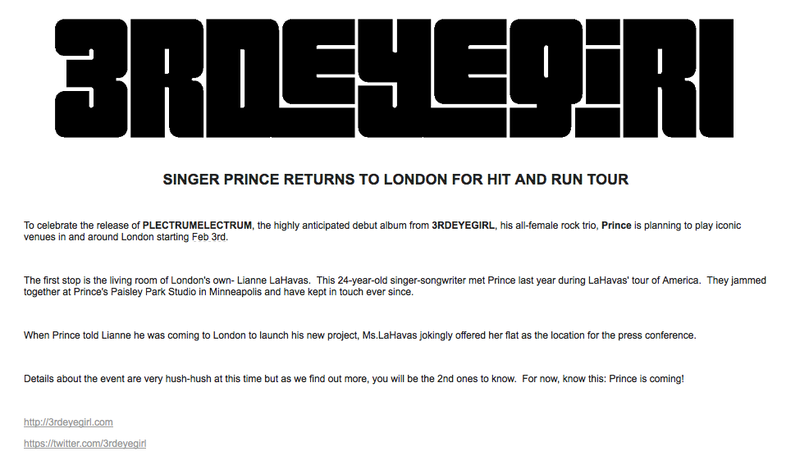 Hammersmith Apollo too big for these 3rd Eye Girl gigs? Perhaps. Huh? The place was designed specifically for fantastic accoustic sound. No, it wasn't. And the presence of those ridiculous fibreglass mushrooms suspended from the roof do little to improve it. I have hear a few people say about bad accoustics at the RAH, I have seen a been a few time and never experienced that. I saw the youth proms there last year and there was all different styles of music from a band to an orchestral, all sounded very good. Ooh, what about Battersea Power Station or Hampton Court Palace? I wish it would be the latter as it's so close to home. They do host concerts there on occasion. There are reverb issues, and knowing how much of a fuss Prince made at the O2 I can't see RAH working. Personally I'd welcome a venue as small as Bush Hall, as long as I could get a ticket of course!